The Australian Indigenous Languages Collection (AILC) was established in 1981 and is held in the Library of the Australian Institute of Aboriginal and Torres Strait Islander Studies (AIATSIS). The collection brings together over 3700 published items written in 102 of the over 250 Australian Indigenous languages, and is the only one of its kind housed in one location and catalogued as one collection. Before the European colonisation of Australia there were over 250 languages and 500 dialects spoken by Indigenous people. Of these languages, only 145 are still spoken, and over 100 will cease to be used over the next three decades. Australian Indigenous languages are unique and spoken nowhere else in the world, so their loss is not only a loss for Australia, but for the world. The AILC plays a vital role in preserving these languages, and assisting Indigenous groups to revive them, and thus is of considerable community significance for Australia’s Indigenous people. The collection covers languages from all parts of Australia: from Tasmania to the Torres Strait and from the Kimberley to the southern parts of Australia, and is a storehouse of cultural knowledge and tradition for Indigenous Australians. 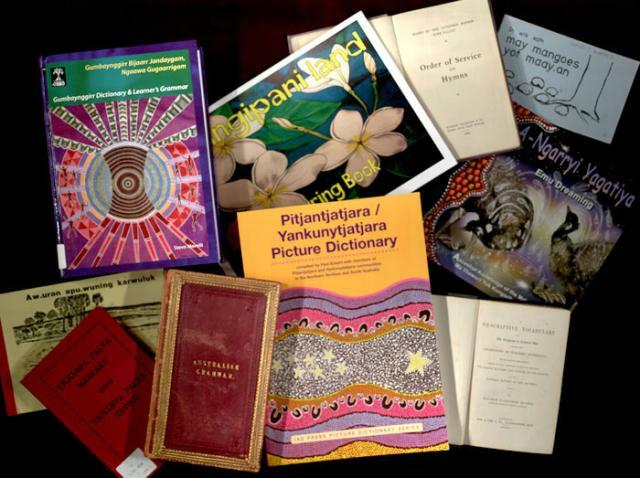 The collection provides examples of the types of materials produced in Indigenous languages, including early works such as children’s readers and Bible translations, dictionaries, grammars, vocabularies and language learning kits produced by Indigenous Language Centres, and works of the imagination. It provides an historical overview of languages that have been recorded for teaching and learning purposes. Some of the items in the collection are of aesthetic significance, particularly children’s readers illustrated by celebrated Indigenous artists such as Mawalun Marika, Djoki Yunupingu, both from Arnhem Land; and Dennis Nona and Alick Tikopi from the Torres Strait.